Selkeites: The farm system seeded by Canadiens GM Frank Selke in the later 1940s began to bear fruit in the early 1950s. In 1953, it yielded a Stanley Cup, the first of six he’d win with Montreal. 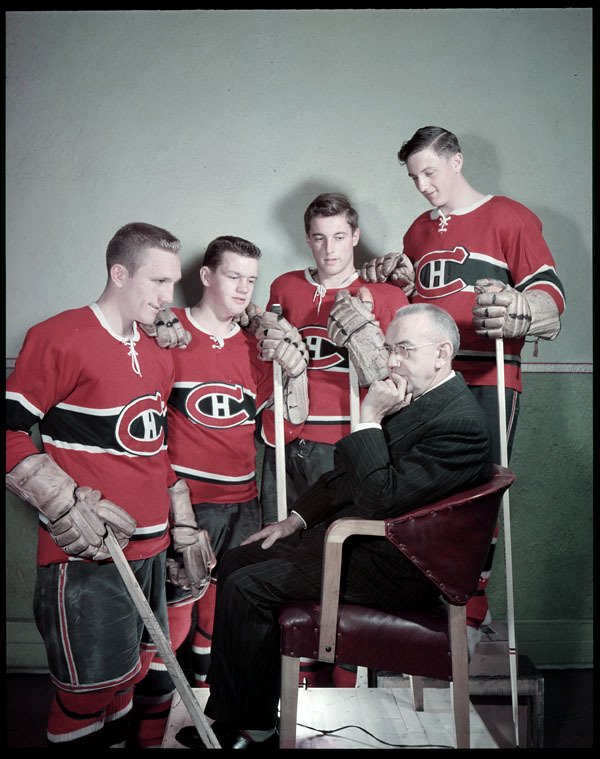 Above, Selke sits in a grove of his recruits in a photograph dating to (at a reasonable guess) the start of that championship ’52-’53 season, which would put all four players at 21 or 22. From the left, those are centres Paul Masnick, Reg Abbott, and Jean Béliveau along with left winger Dickie Moore. Selke, Masnick and Moore got their names etched on the Cup that year; Abbott and Béliveau weren’t so fortunate. Each of them skated in three regular-season games but neither one saw any ice in the playoffs. 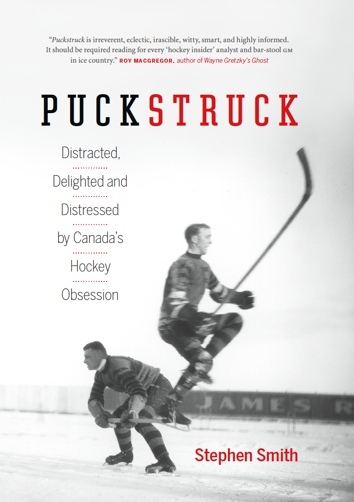 Abbott’s statistics were and remain blanks — he failed register a goal or assist, incurred no penalty minutes — and he never played another NHL game. For his part, Béliveau, scored five goals in his three games, launching a career that nobody has to be reminded to celebrate. It is worth noting, Abbott-wise, that he did wear sweater number 4 in ’52-’53, a season before Le Gros Bill got hold of it and made it his own. Having started his Montreal career in 1951 wearing number 17, Béliveau was by this time sporting 12 — which, of course, Dickie Moore would go on to make sufficiently his own that the Canadiens ended up retiring it in his name. Paul Masnick? While he tried out both 22 and 23 during his Montreal career, in 1953 he was 11. ← are you afraid of anything?